„Infra-noir”, un et multiple. 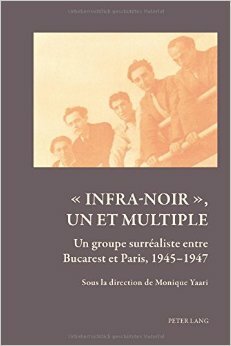 Un groupe surréaliste entre Bucarest et Paris, 1945-1947. Dir. Monique Yaari. Peter Lang, Bern, 2014. A new series of books (Art and Thought: Histories of the Avant-Garde, edited by Dawn Ades and Timothy Matthews) was initiated at Peter Lang with the collective volume on the activity of the Bucharest surrealist group. It is a brave and interesting choice to begin this new series with an internationally lesser known avant-garde group, but in fact more than one third of the volume consists of an effort to increase the visibility of this very group activity by including a facsimile edition of their collective texts (Dialectique de la dialectique; Présentation de graphies colorées, de cubomanies et d’objets; L’Infra-noir: Préliminaires à une intervention sur-thaumaturgique dans la conquête du desirable; Éloge de Malombra, cerne de l’amour absolu and Le sable nocturne) and their individual French texts published in 1947 in Bucharest, in their collection called Infra-noir. So far, only some random scanned editions of these were accessible on the internet, Romanian publishers offered only a selection of them in avant-garde anthologies, and even the reedition of the Infra-noir series at Maison de Verre (Paris) in 1996 had several deficiencies, listed by Monique Yaari on page 30 of the present volume. One of the main objectives of the volume was therefore achieved: scholars have now access to a reliable international edition of the original French texts. The quality and intellectual value of these texts render the choice of the editors legitimate, and for some readers might bring about the discovery of a “new” surrealist group, which had nevertheless a certain international notoriety around the 1947 International Surrealist Exhibition, and some of its members (like Gherasim Luca or Gellu Naum) also attracted the attention of larger international audiences late in their lives. The book is well structured – after the introductory remarks by Monique Yaari, where a general overview of the group’s activity is outlined, a chronological approach is preferred, and the authors of the volume (all of them established scholars of the avant-garde) offer a detailed contextual analysis of the surrealist texts published in the appendix of the volume. In a much more detailed analysis, Krzysztof Fijalkowski presents in the following chapter the works of Gherasim Luca, one of the leading figures of the Bucharest group. Largely based on his previous publications on Luca, Fijalkowski’s paper succeeds in offering a synthetic approach on Luca’s activity, mainly in its theoretical and visual dimensions. After the insightful monographs on Luca by Petre Răileanu, Dominique Carlat and Iulian Toma, Fijalkowski’s approach is important precisely because the activity of the group in the field of visual arts (and the way they tried to avoid the traps of ’art’ within the visual dimension) was less known and less documented until recently. Luca’s objects and ’cubomanies’ are presented by Fijalkowski in the non-oedipian theoretical framework developed by the artist himself in cooperation with Trost, which was to become later a source of inspiration for Deleuze and Guattari. Françoise Nicol offers an introduction into the more theoretical works of Trost (Le même du même; Le plaisir de flotter) in a sensibly different manner, with several question marks that suggest an openness of discussion concerning the works of the author. Vision dans le cristal, one of the works that Trost had published in 1945, outside the Infra-noir series, is largely referred to throughout the analysis, suggesting that the group activity itself and the theoretical framework cannot be described just through the collective texts and the Infra-noir collection (this is valid also in the case of the chapters concerning Luca and Păun in the volume). Although the cooperation between Trost and Luca is relatively well-known through their manifesto Dialectique de la dialectique, the reader can feel that Trost’s role within the group has not been thoroughly described yet, the first monograph dedicated to his works having been published only recently, in Romanian language (Michael Finkenthal, D. Trost între realitatea visului și visul ca realitate, Tracus Arte, Bucharest, 2013). Monique Yaari’s chapter on Paul Păun/Paon is essential because of its references to late, unpublished materials like the author’s Carnet or La rose parallèle which also offer new perspectives on the activity of Trost and his cooperation with Păun. A discrete presence within the group, and adopting in-between positions during the disagreements between Gellu Naum and Trost/Luca, Paul Păun seems to have remained faithful to his surrealist practices throughout his entire life, even after his emigration to Israel. Another element of novelty in this chapter of the book is again the importance given to the visual dimension of Păun’s activity – which comprises several exhibitions and illustrations of books and booklets. Régine-Mihal Friedman offers a brief analysis of the collective text Éloge de Malombra, in the context of Mario Soldati’s movie Malombra that inspired the Bucharest surrealists when writing their Éloge. Carefully documented as far as the surrealists’ connections to cinema are concerned, the article is less precise in its references to the relationship between Antonio Fogazzaro’s novel and Soldati’s adaptation (although we can agree with the fidelity of Soldati concerning the character types described by Friedman, p. 215, the formulation „Soldati … a fidèlement suivi sa source littéraire” might be misleading if we go into details like the nationality of the secretary – switched to Hungarian from German in the original novel etc.). The article describes though quite precisely the Éloge of the Bucharest group when situating their text in-between the surrealist collage/cadavre exquis and the duchampian ready-made (p. 215), and an interpretation that consists in fact of (free) associations. Jacqueline Chénieux-Gendron analyses Le Sable nocturne, a last collective text of the group that was published in the catalogue Le Surréalisme en 1947, accompanying the International Surrealist Exhibition organized at Galerie Maeght. An insightful presentation of the book itself problematizes the very status of the different texts published in it. Calling the collective text a “blind spot” of the catalogue, Jacqueline Chénieux-Gendron argues in fact in favour of the concepts behind Le Sable nocturne – the anonymity, the obscurity of the room described in the text, the possibilities of rich sensations that can occur in a darkened room are key elements of this vision. The “blindness” has in this context a voluntary nature. The volume coordinated by Monique Yaari, while synthesizing much of the scholarship on the Bucharest surrealist group, knows at once more and less than the present collective knowledge about the group. Its most positive aspects are besides the documentation and publication of the collective efforts of the Bucharest surrealists the stress upon the visual activity, and the presentation of new sources concerning the group, so far accessible only in private archives. The volume knows less than it should know because it deliberately leaves out Virgil Teodorescu’s poetry from the analysis, even if the two volumes of Teodorescu, published in the Infra-noir collection, are reproduced in the Appendix. In the Introduction, Monique Yaari argues: “La decision de ne pas inclure dans ce volume une analyse des deux plaquettes dues à Teodorescu ne se fit pas sans regrets ; car, si l’ensemble de son œuvre littéraire ultérieure est de langue roumaine et l’excluait donc en vertu du critère linguistique de notre sélection, ces textes font néanmois partie intégrante de l’aventure «Infra-noir»”. (p. 30) Teodorescu’s case differs indeed from the choice of his colleagues in the sense that the late works of the other members of the group were written in French, while he switched back to Romanian after the Infra-noir experiment, but his French texts are nevertheless part of the same corpus like the other publications of the Infra-noir, and a brief overview of them would have increased the interpretative value of the present volume. The decision of not including in the volume a chapter concerning Gellu Naum (who chose not to publish individual texts in French during this period) is easier to understand. However, for those who know the Romanian texts of the authors of Infra-noir, and are familiar also with the works of Naum, several speculations of the present volume concerning the obscurity, blindness or references to mediumnic activity would stand on more solid ground. Sources of Romanian language published in Athanor. Caietele Fundației Gellu Naum 2/2008 and the exchange of letters between Victor Brauner and the members of the group would have offered also additional pieces of information to the excellent article of Jacqueline Chénieux-Gendron concerning the preparations of the 1947 surrealist exhibition and the text of Le sable nocturne. We may conclude that the collective effort initiated by Monique Yaari is a landmark of the philology of the Bucharest group, and generally is a very informative volume capable of stirring interest towards the Bucharest surrealists. But those who would like to understand the vision of this group in its entirety, will have to do some further reading concerning Gellu Naum, Virgil Teodorescu and also the Romanian texts of Trost, Păun and Luca. Thank you for the comment, I am glad to have this clarification. My sensation was that Virgil Teodorescu’s texts are now the only ones within the group’s activity that have not been discussed in recent international scholarship, and that is why I tried to argue in favour of such discussions. Congratulations for the volume anyway, the visual and theoretical dimensions are interpreted quite accurately indeed throughout the whole volume.